I was coming home this afternoon and I saw this right by my front door! 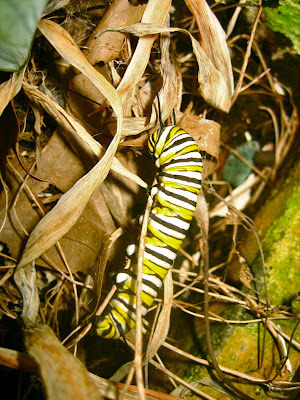 A Monarch caterpillar! Since there is no milkweed in my front yard (that's what the caterpillars eat), I am suspicious that he might have left his food source to find a place to build his chrysalis. That would be cool to watch! I'll post more pics if I see him again!